Planning and managing a project can be one of the most frustrating experiences of your life, but it doesn’t have to be. The Critical Path Project Template utilizes the critical path method of project management to provide you with a simple solution to common project management problems. This method is made up of a number of different activities that often requires smaller “tasks” in order to complete. Instead of one complex and confusing project, you develop a system of simple tasks that can easily be completed by you and your team. Learn more about this amazing free template by reading the guide below. After downloading the free Critical Path Template to your computer, you will start customizing the document to fit your needs. The first step is to enter the start and planned finish dates of your project in the indicated areas at the top of the page. 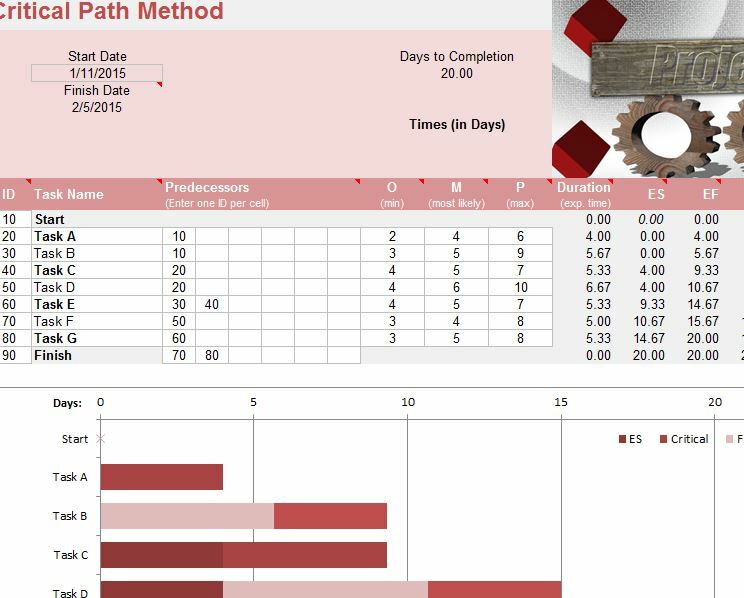 The Critical Path Template will display the difference and give you the numbers of days you have left until completion as well. In the main table of the document, you will start organizing your tasks. You can list the ID for your task, along with the task name in the corresponding cells. Next, enter the number of “Predecessors” your task will have. This simply means the number of events proceeding tasks or “sub-tasks”. The letters in the next section of the document, “O-M-P,” are tools to measure the likeliness of your tasks being completed on time. They range from optimistic to pessimistic. The last section will allow you to enter any special changes to your work schedule. For example, if you start late, you can list the new time under the “LS” section. To learn what each category stands for, merely hover over the term and a dialog box will appear with the information you need. All this data will be displayed in the graph below to show the progress of each task. There is also a convenient “Holiday” tab to have certain days of the year excluded from your chart.